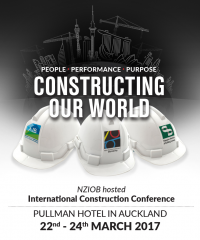 The ‘Constructing our World - People, Performance, Purpose’ conference will take place from 22-24 March 2017 and is being hosted by the New Zealand Institute of Building (NZIOB) in collaboration with the Australian Institute of Building (AIB) and the Singapore Institute of Building (SIBL). Subsequent international construction conferences will occur in Australia in 2019 and Singapore in 2021. Helena Lidelow, Associate Professor at the Lulea University of Technology in Sweden, is another confirmed keynote speaker. She will present on ‘Industrialised construction in Sweden - from single-family homes to multi-family buildings’. Original generation time 1.7850 seconds. Cache Loaded in: 0.0004 seconds.